Milwaukee Road passenger service ended in 1952. 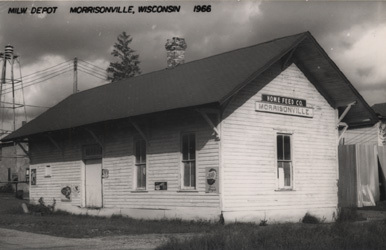 The depot was then moved from its original location and used as a storage building for the Home Feed Company (now demolished) in Morrisonville. The Morrisonville Depot is located on the old "Madison & Portage Road" of the former Milwaukee Road in Morrisonville, Wisconsin. Morrisonville is on the Dane/Columbia County border in south central Wisconsin. 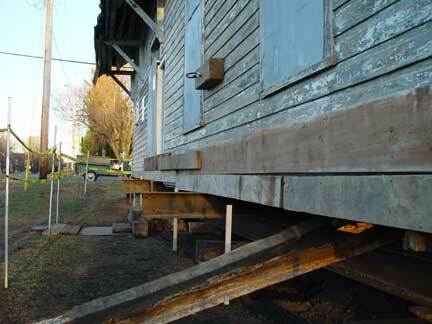 Save the depot from demolition and halt further damage to the structure. Find a suitable location for the depot with proper orientation along the right-of-way. Convert the depot into a permanent museum for the history of the Chicago, Milwaukee, St. Paul and Pacific Railroad's (Milwaukee Road) Madison & Portage line and the early rural history of this area. In the fall of 2002 MDPSI contracted with a building moving company to secure and raise the depot onto steel beams in preparation for a move in 2003 to a new site. Due to complications in purchasing property along the right-of-way the move is currently on hold. At this time, March, 2010, we are getting very close to purchasing the land for the depot. Once land is purchased, the depot will be moved onto a new foundation, a new roof will be installed and restoration will begin. If you are interested in getting involved we would love to have your support! There will be many meetings ahead where it will be crucial to have a show of support from the community. We will need a lot of help with the physical work, which will require many skills, craftsmanship, tools and just plain hard, but rewarding work. 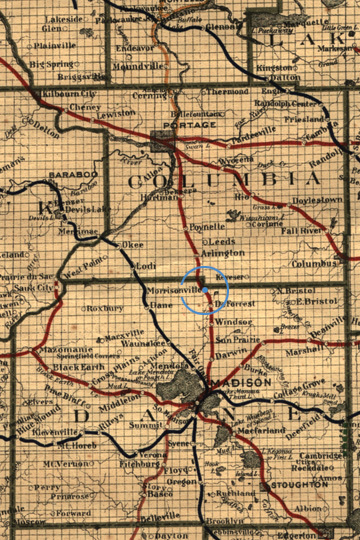 This detail from a 1917 Wisconsin Railroad map shows the location of Morrisonville in relation to Madison, the state capital. It also shows the route of the Madison & Portage line of the Milwaukee Road. Detail from 1917 railroad map. Fall 2003. The depot is raised up on steel beams to stabilize the structure.